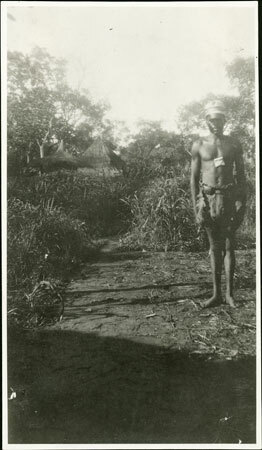 A man (identified as Jacobo) wearing a brimless straw hat (kutuku) standing next to a path leading to a homestead, with hut roofs visible beyond. Round his neck hangs a small woven grass pouch, possibly containing medicines. notes on print reverse ms pencil - "51/7 +18"
Notes on card mount m/s pencil - "Hole lower LHS SS overall 8.89"
In The Azande (OUP, 1971, page 71) E. E. Evans-Pritchard notes that whilst the earliest noted Mbomu hats were brimless straw hats with plumes called kutuku, "the hat which is today fashionable, and has been for some years, is of much the same shape but with two new features: black lateral patterns, often wavy lines, and a broad brim, the first being copied from the Mangbetu and the second from the earliest Europeans." Morton, Chris. "Portrait of a Zande man" Southern Sudan Project (in development). 03 Jan. 2006. Pitt Rivers Museum. <http://southernsudan.prm.ox.ac.uk/details/1998.341.729.2/>.